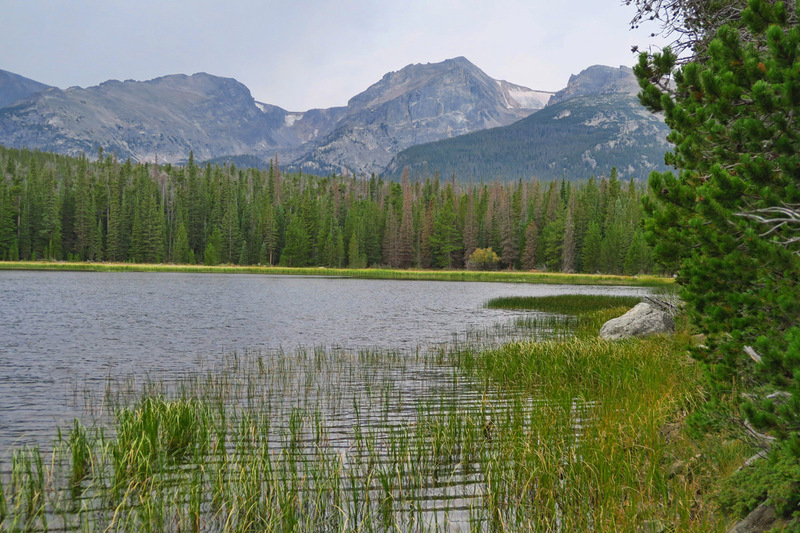 After spending almost a week on the west side of Rocky Mountain National Park, I still hadn’t had enough of the mountains. Steamboat was beautiful, but the ridiculously expensive RV park where I was staying was too far in the opposite direction from the hiking trails, requiring a tedious drive through traffic to get to any areas suitable for a hike. 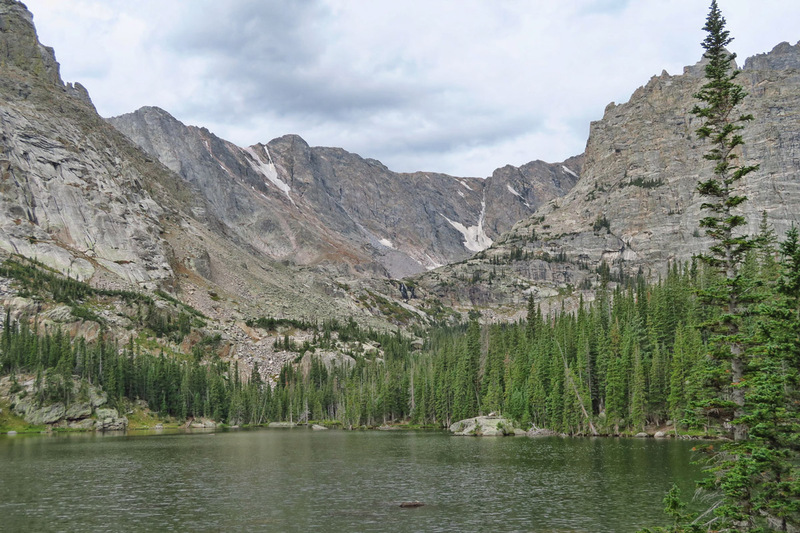 A look at the map reveals it won’t be that far to backtrack from the I25 corridor to Estes Park to visit the east side of Rocky Mountain National Park. 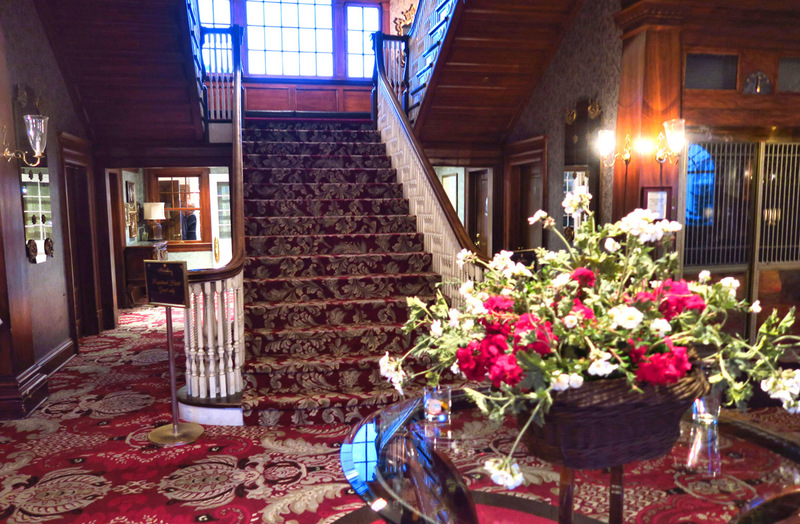 The famous hotel has a storied past with tales of haunted rooms. 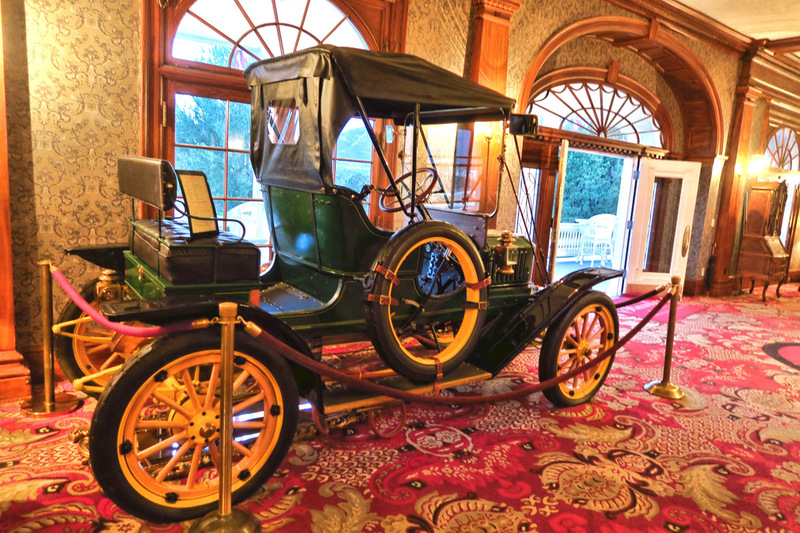 There is even a ghost tour offered. 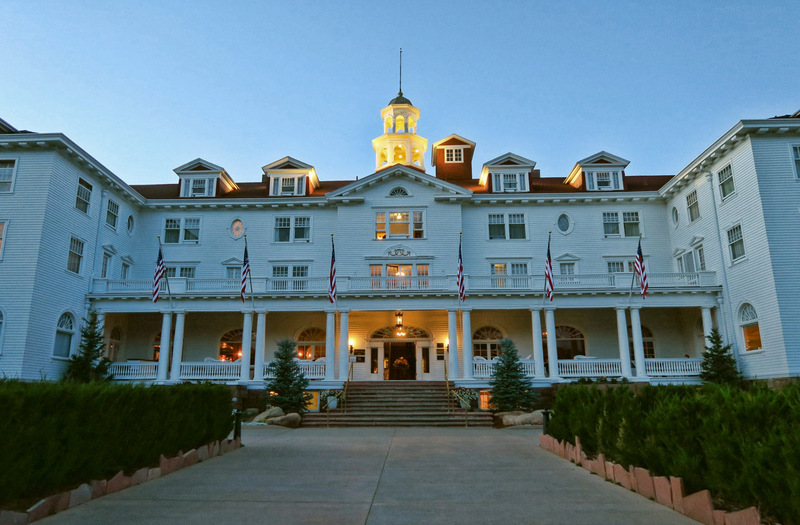 The hotel has served as a set for several movies. 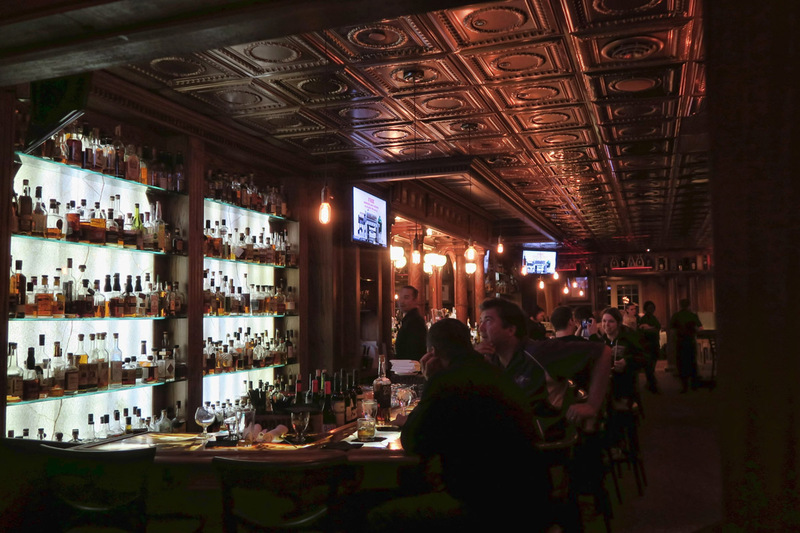 The Stanley’s famous Whiskey Bar, which is reported to offer 1,200 varieties. I go online knowing campgrounds inside the park book up six months in advance. By some fluke, there is an entire week of consecutive nights in the same spot available in the very popular Moraine Campground. It had to be a cancellation. My nervous knuckles and sweaty palms race across the keyboard to claim the space before it’s sold out like the other 246 sites. I am particularly happy about being in the Moraine Campground because of its bus stop on the east side shuttle system. Not only will this save the Little Tracker from having to climb the mountains and do the road work to get to the trail heads, but I won’t have to jockey for position in RMNP’s over-crowded parking areas. 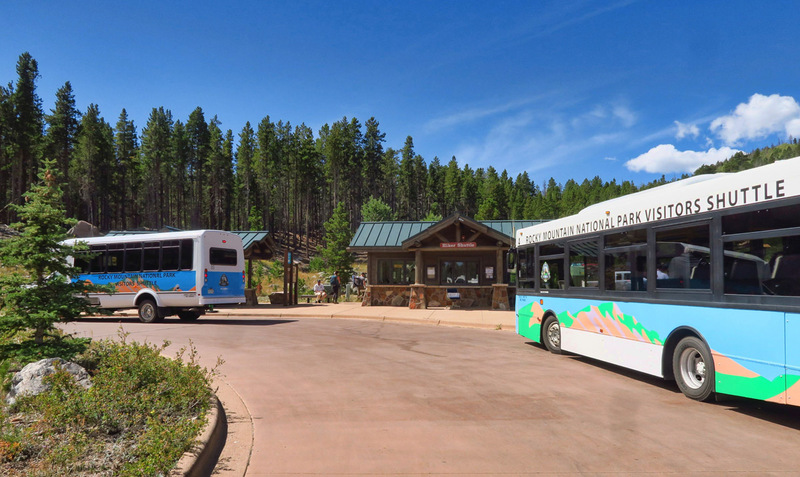 The Park & Ride facility inside RMNP is the hub for three different shuttle routes, including a Hiker Express that shuttles people in from the town of Estes Park. 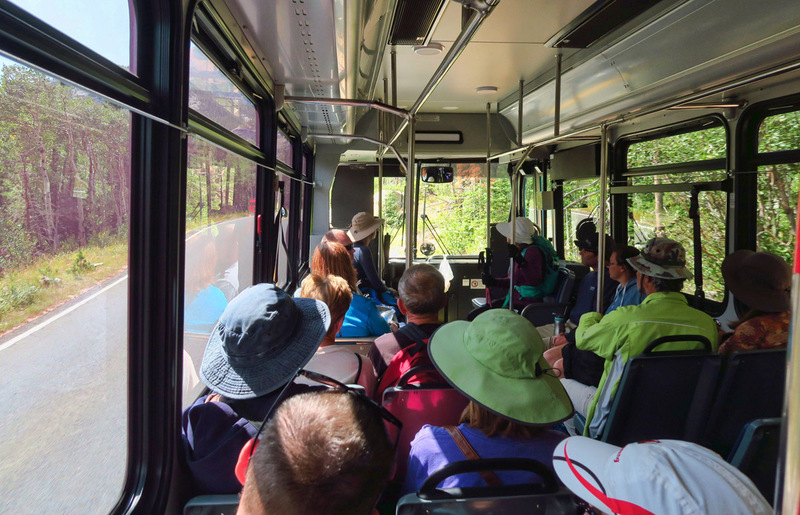 The shuttle bus is an excellent way to do one way hikes such as the “top down” hike from Bear Lake back to the campground. 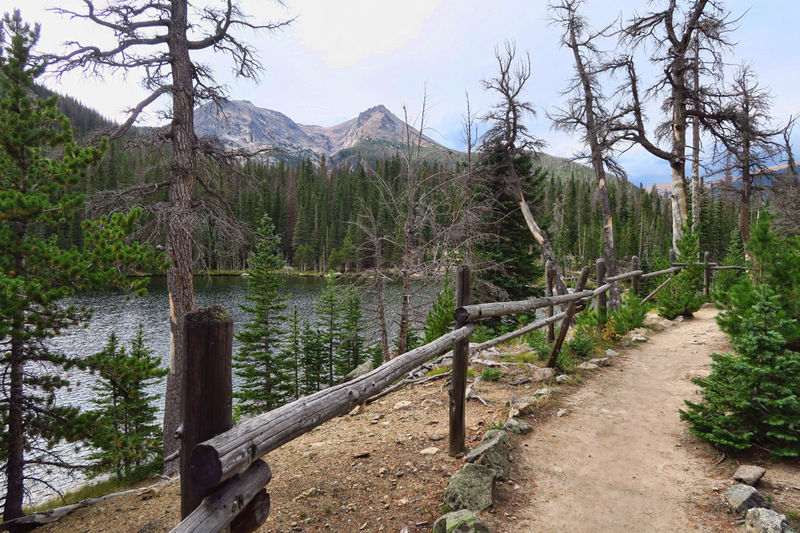 Beautiful, uncrowded Bierstadt Lake is my lunch stop on my one way hike down the mountain. 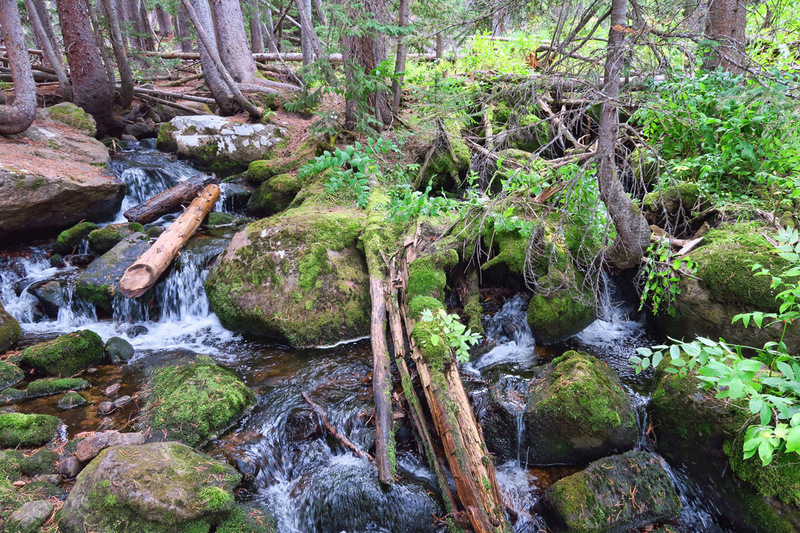 Mill Creek, runs through Mill Creek Basin. 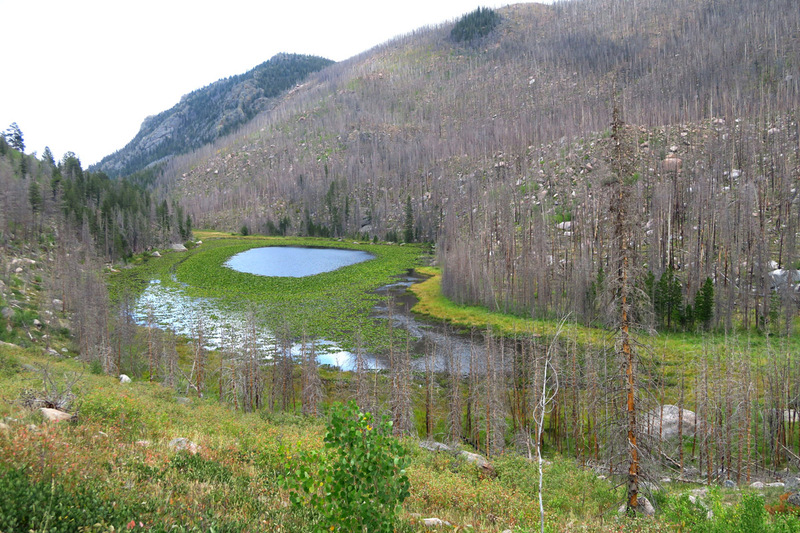 Hiking from Bear Lake back to the campground leads me through the site of the Fern Lake Fire, started from an illegal campfire in 2012. 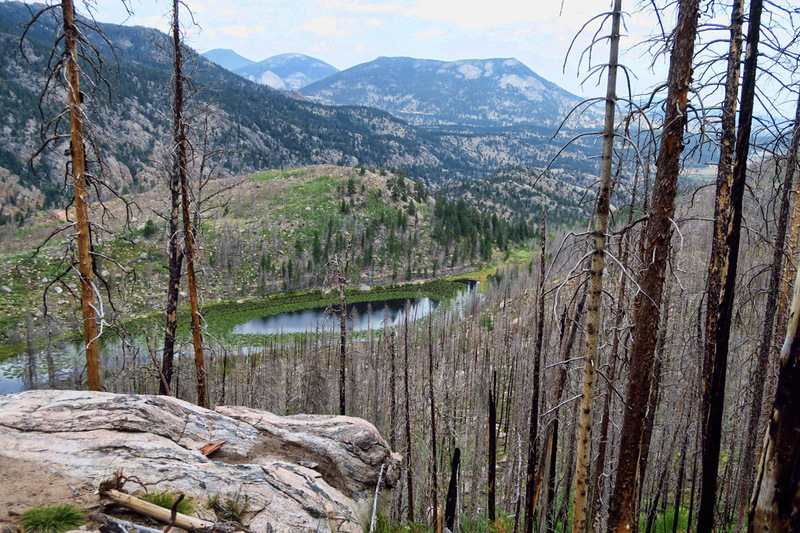 I think we hikers are going to see a lot more of this “scorched earth” in the days ahead. 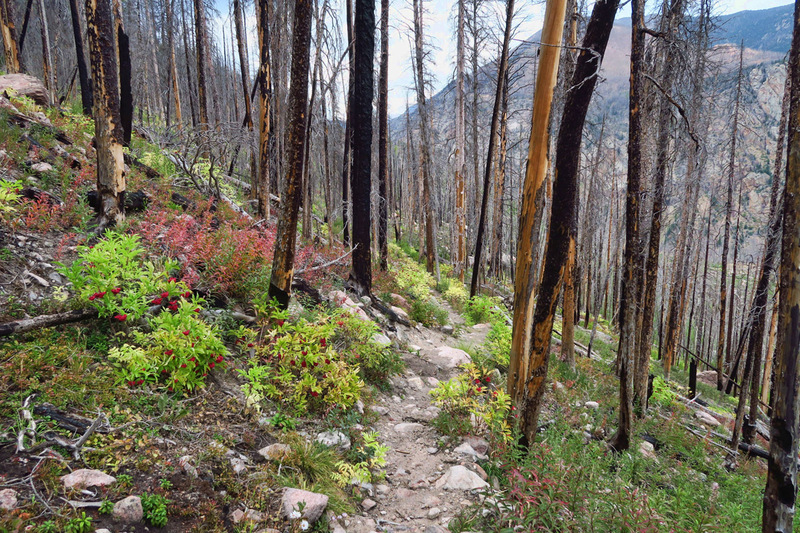 Five years after the fire, the vegetation is regenerating in vibrant colors. Overlooking Cub Lake, which is much larger than the round shape, as much of it is covered in water lilies. But even more fun is the freedom that the shuttle service brings for doing one way hikes without having to backtrack. 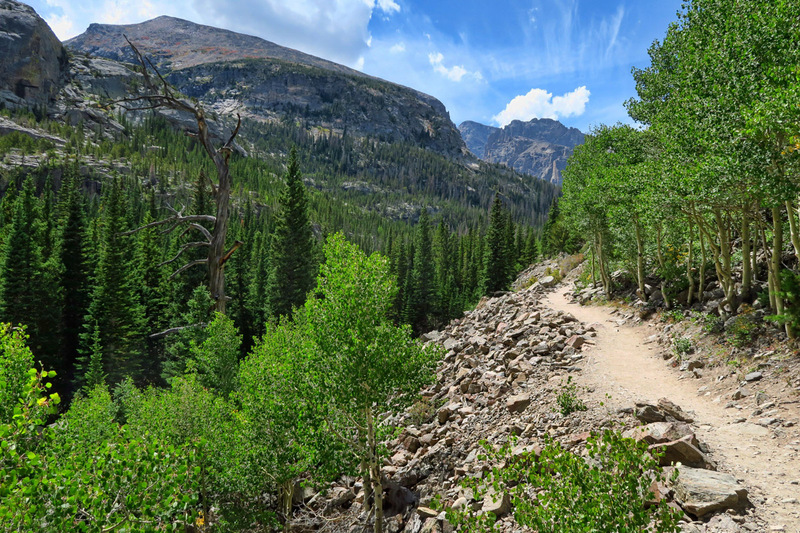 Rocky Mountain National Park has 350 miles of trails, many of them which intersect like tangents of a spider web. Having access to the shuttle system means I can take off in many directions without having to worry about getting myself back to the same trail head. Just head down any trail that feeds in to a bus stop, which ultimately takes me back to the Winnie! I nearly fell over dead with laughter! But…it’s not just the two-legged newlyweds. Love is in the air! It’s mating season for the elk, and love songs can be heard throughout the evening. 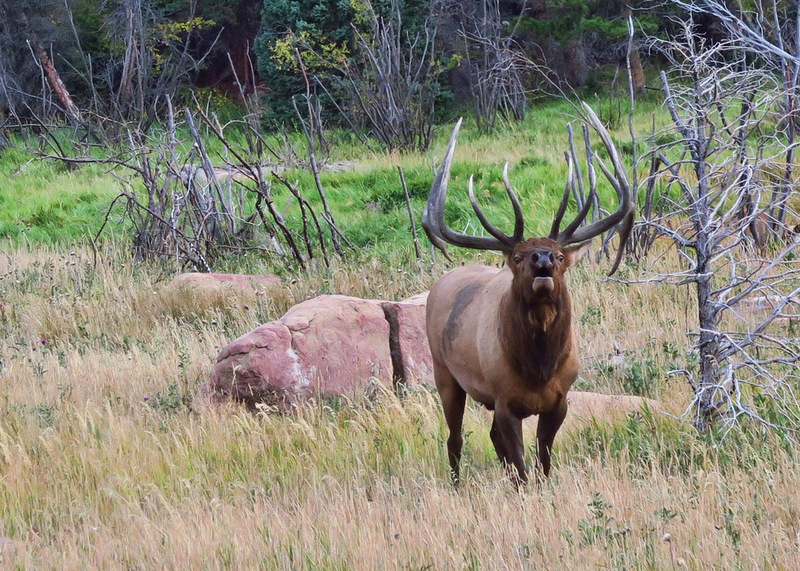 Cooler temperatures and shorter days signal the start of the mating season called the “rut.” Bull elk can be heard bugling in an effort to attract females or challenge another bull. 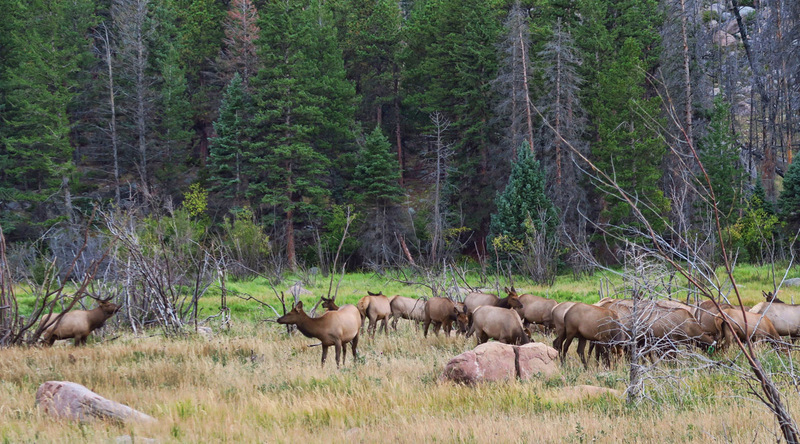 The elk spends all day grazing, and consumes on average 20 lbs of grasses, pine needles, bark, and shrubs. 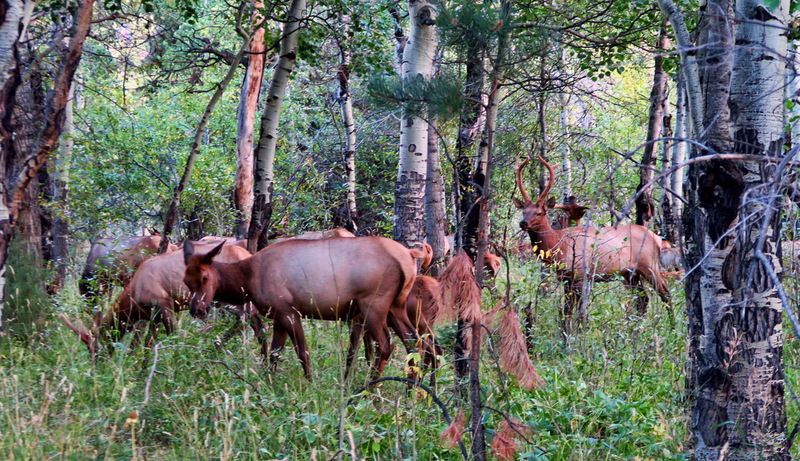 During the summer growth cycle, a healthy diet can mean antler growth for the bull elk at a rate of an inch per day. They grow a new pair of antlers every year which can weigh up to 40 lbs, then shed them in early spring to start over. I find it fascinating that the antlers actually have feeling before they harden, as the “velvet” which provides blood supply to the antlers begins to itch when it sheds. Knowing this will certainly add to my discomfort when viewing the “rack wall” at Cabelas. I am fortunate enough to run into a large herd of elk on two of my hikes in two different places, though likely the same herd. The first time, I can hear them long before I can see them. Along the path, I can hear the bugling, but having little experience with the signals, I have no idea how far away they are, or how many there are. 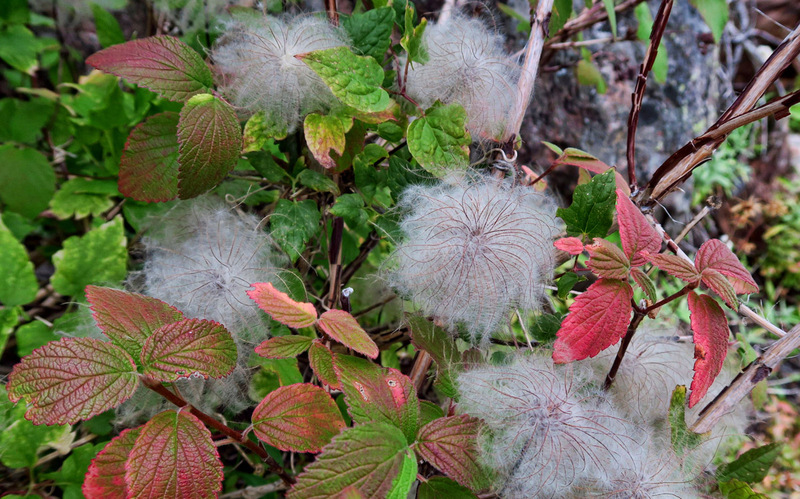 I am stunned to crest the trail and see them so close, and in such large numbers. There must have been fifty of them. My first sighting of the herd. Note the bull over in the bushes to the left. I try repeatedly to capture his loud screeching bugling on video, but my timing is never good. 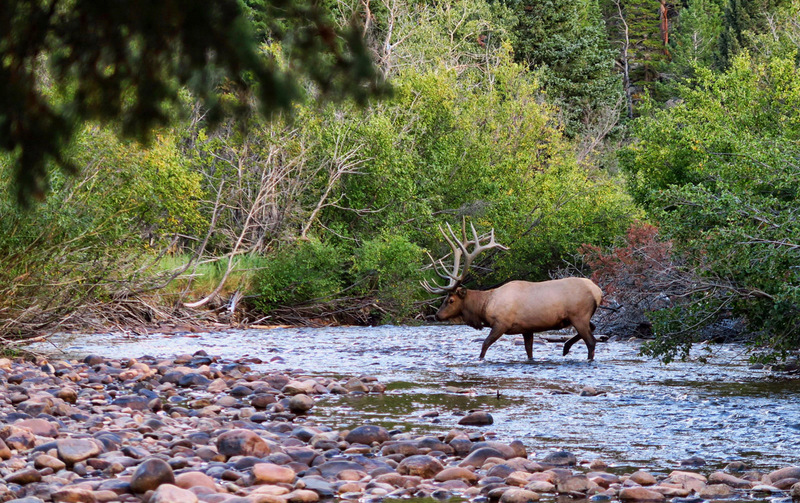 The next day, I choose a different hike in close proximity in hopes of seeing them again, and come upon them just as they are crossing the river. I try to keep my distance, but they are right alongside the path, so I wait, while standing behind several large boulders. Meanwhile, it’s fascinating just listening and watching the bull and his harem interact. The cows and calves make mewing sounds and chirp back and forth at each other like a small town social. 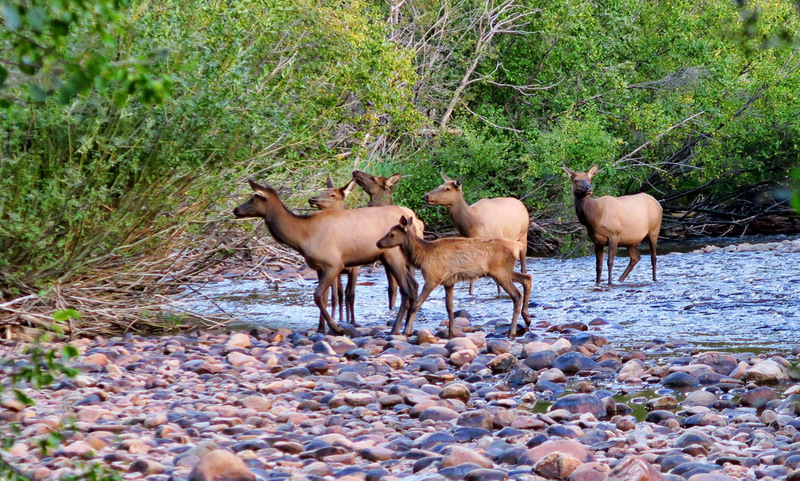 The next day, I find them crossing the Big Thompson River. Such majestic animals! The big bull is always bringing up the rear, herding his harem. They seem to be very social animals. I enjoy hearing the bugling sound, a screeching scream of the bull elk, just as I enjoy the howl of the coyote, especially in the wee hours when I am safe inside the Winnie. When the night is still and quiet beneath the thumbnail moon, their sounds make me feel like I am someplace in the wild. 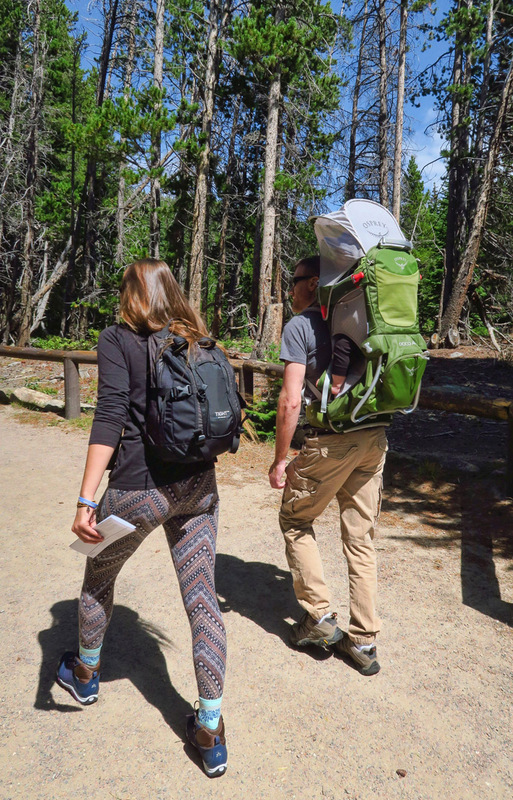 “Without parks and outdoor life, all that is best in civilization will be smothered. 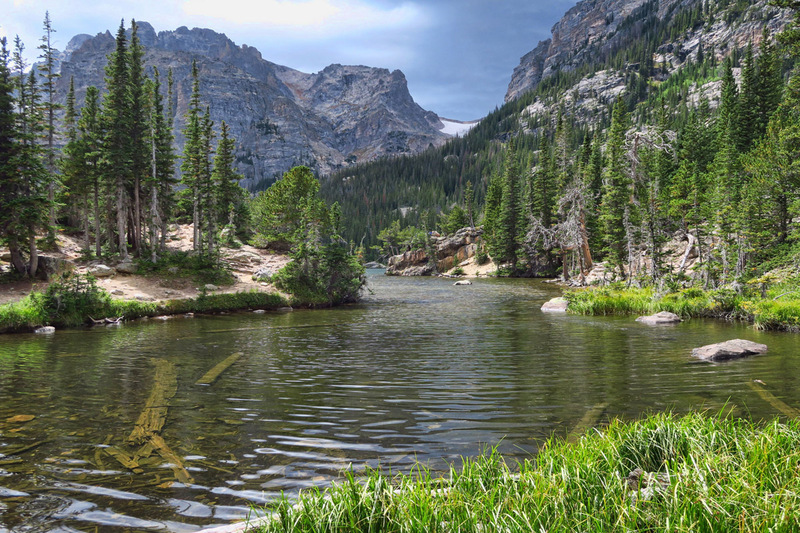 To save ourselves, to prevent our perishing, to enable us to live at our best and happiest, parks are necessary to find ourselves, in which to think and hope to dream and plan, to rest and resolve.” Enos Mills, father of the RMNP, internationally known naturalist, author, lecturer, and nature guide. 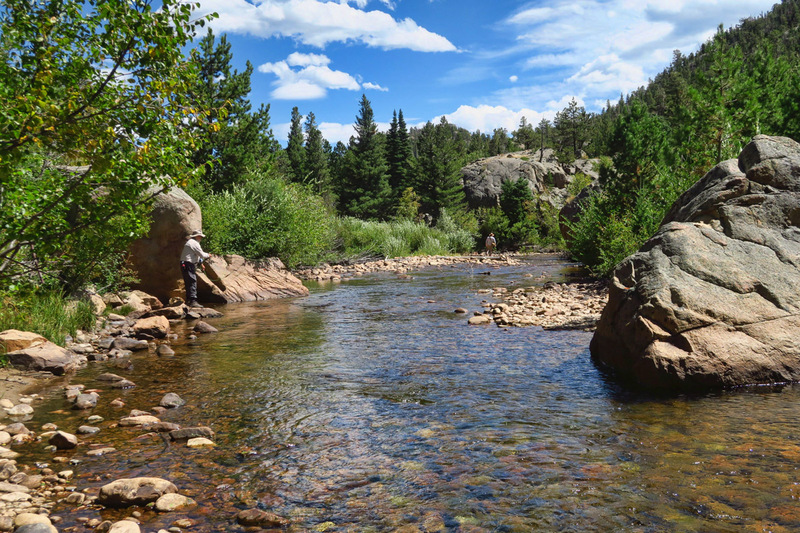 The hike to Fern Lake starts out along Fern Creek, where many fly fishermen (two seen in this photo) report success, though it is catch and release. 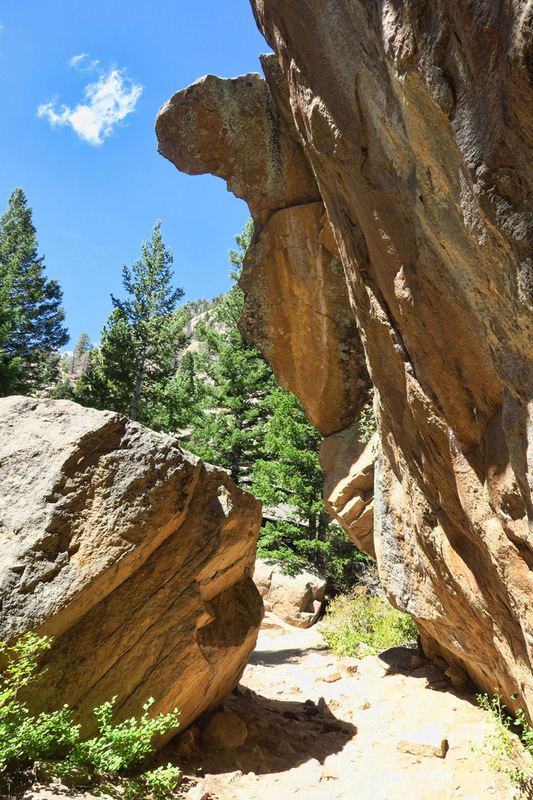 The Fern Lake Trail passes through house-sized boulders called “Arch Rock” for obvious reasons. 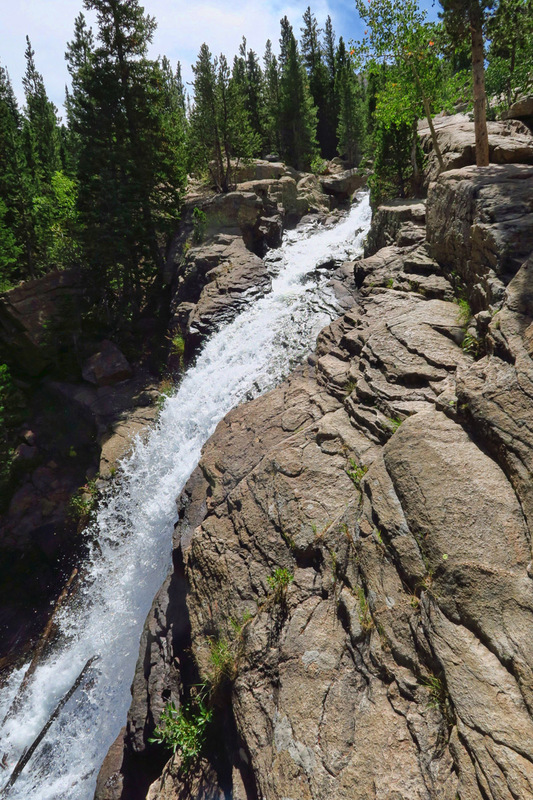 The trail passes Fern Falls, a 60 ft waterfall. The trail was built by loggers in early 1900’s, and is now on National Register of Historic Places. Fern Lake Patrol Cabin, built in 1925, and functioned as a ranger station until 1949. Fern Lake, though actual lake is on the other side of this row of bushes. 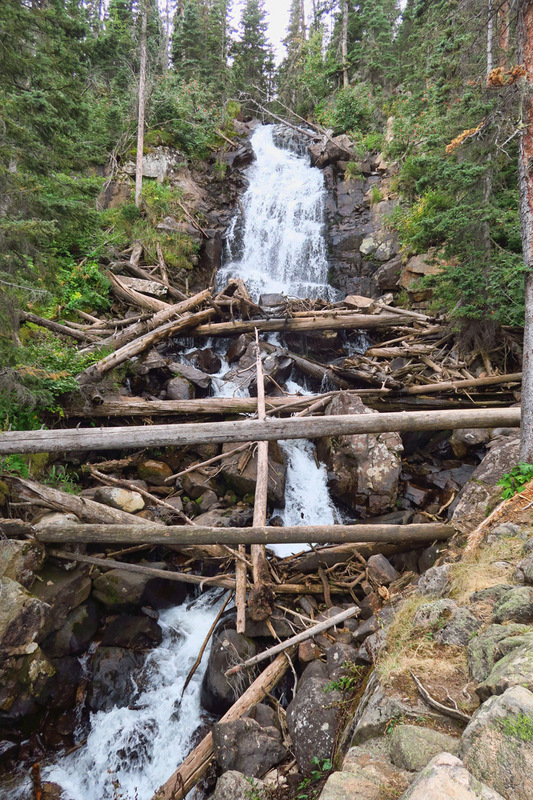 Another lovely hike to The Loch passes Alberta Falls. I loved this hike, as it was scenic the entire way. Approaching The Lock is a stunning sight. 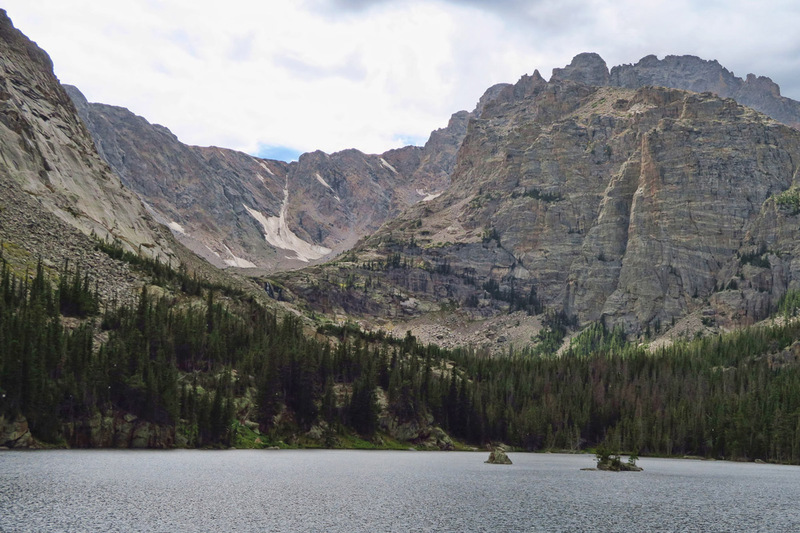 Directly across from the foot of the lake is 13,153-foot Taylor Peak and Taylor Glacier. The Lock, Scottish name for lake, is 10,190 ft in elevation. 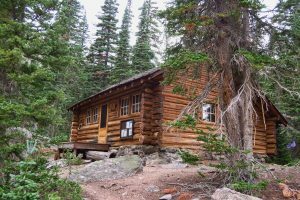 This entry was posted in Colorado, National Parks and tagged Alberta Falls, Cub Lake, Fern Falls, Fern Lake, Moraine Campground, Rocky Mountain National Park, The Loch by Suzanne. Bookmark the permalink. Once again, words are inadequate to express the joy that your photos bring to my heart! 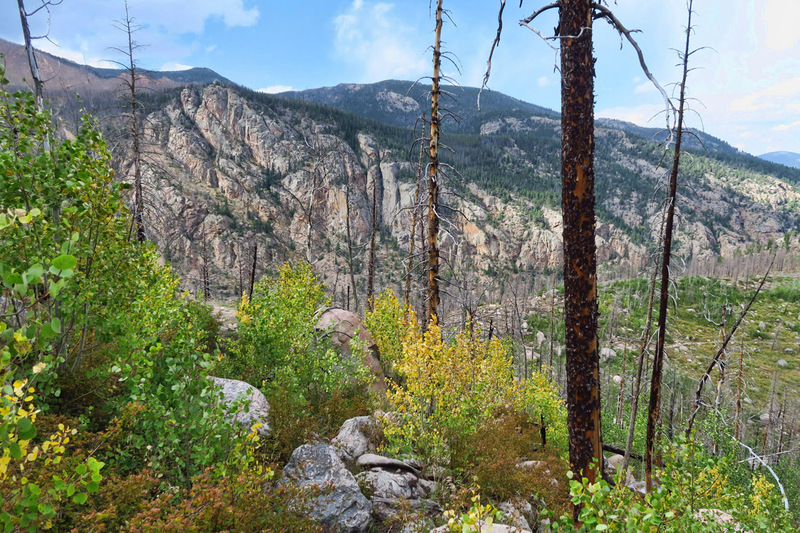 When I was there, they had just finished rebuilding (this time much higher) the roadway after the disastrous Big Thompson flood in 1976, and it was hard to believe that there had been such devastation. 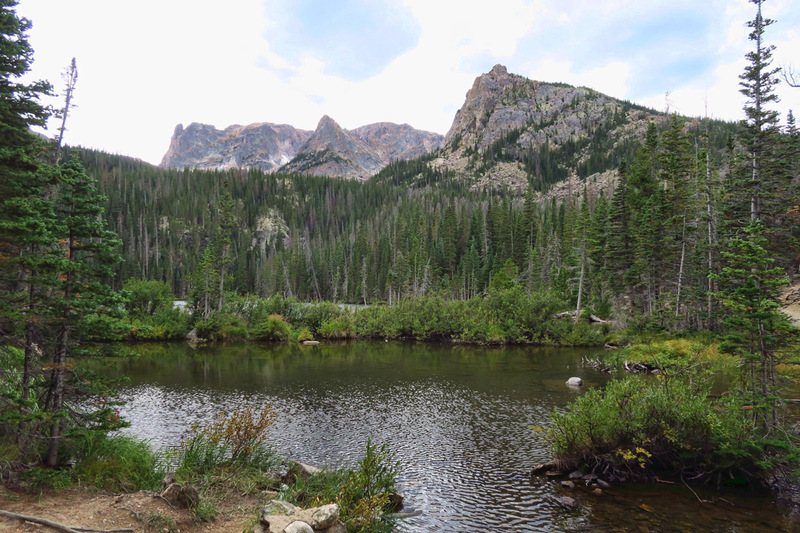 The areas around Estes Park and RMNP have become indelible in my brain and heart. Some of my fondest memories of stalking scenes with my camera are centered right there. Thank you for bringing it all back to life for me. My own photos from that time (1980) are all packed away – somewhere. You continue to be my inspiration and hope for the future. Oh what wonderful pictures! Those elk are beautiful and the scenery is wondrous! Wow what a great set of pictures. Glad that bull elk did not herd you into his harem. Stunning, simply marvelous. Thank you for the photos and your words. And up until the last photo I was thinking how warm it looked there! Hey, Gayle…yes, it was warm, as I was in shorts and tee shirt. But this freak cloud blew in over that glacier on the right, and it started out as 10 seconds of hail, then 10 seconds of snow, then turned to 10 seconds of rain, then it was done. Just enough time for me to drag out the rain gear, only to have to stuff it back in the pack. There is nothing like the sounds of the bulls bugling and the cows chirping through the timber. You not only got to hear it, you got to witness it! The one picture of that bull bulging is awesome! Great shots! Looks absolutely perfect-perfect time, perfect place. So glad you got a site inside the park. It’s so much easier. The shuttle is perfect too. Simply gorgeous pictures. What wonderful elk encountetd. Like Judie, you’re my inspiration especially in the current dark days in my life. Ah, there are so many memories for me in your post! 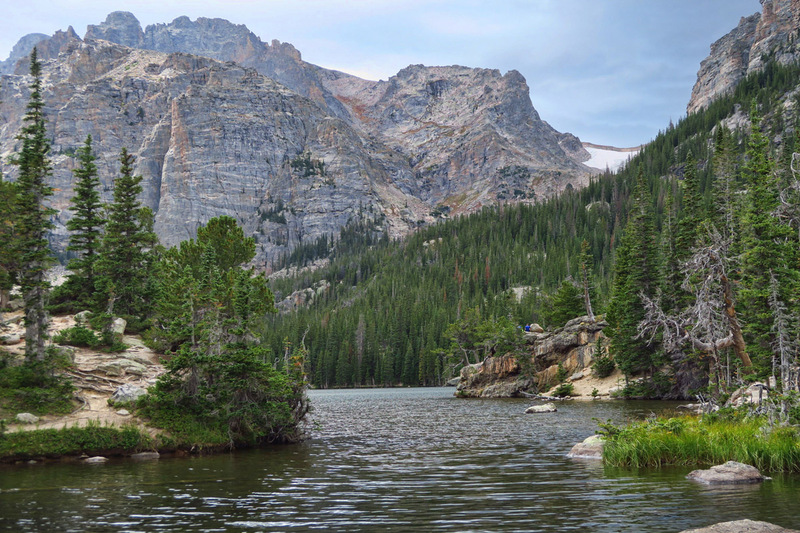 We did all of those hikes many years ago with the kids on our trips to RMNP and always camped at Moraine. A great motivator we used was that once a hike was completed we headed down to Estes to buy a trail patch to sew on their backpacks. Only years ago, they used old school buses for the shuttles rather than the nicer looking ones you showed. Thanks for the beautiful pictures and memories! Love, love, love, this place!! The elk are everywhere. We just had a great laugh over the saying, “newly weds and nearly dead!” So true! Such beautiful country! 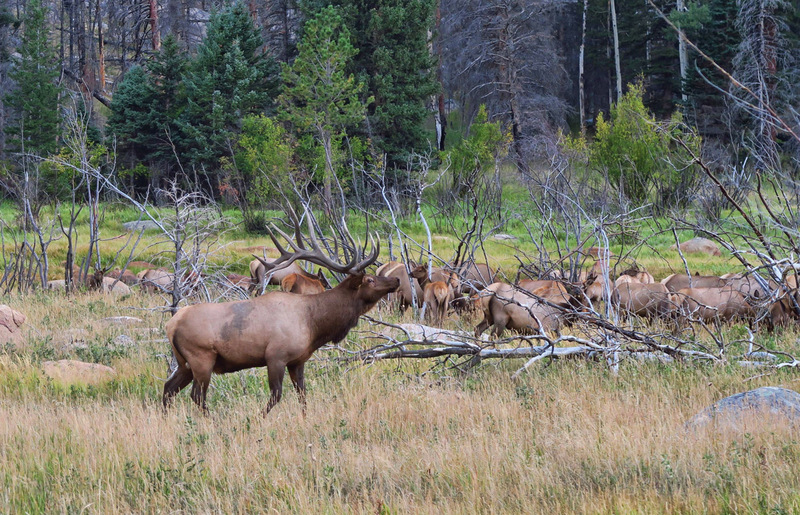 Your story of the elk reminds me of the first time we camped in the White Mountains in AZ. Little did we know at the time that it was elk mating season. It was so noisy during the night that I don’t think we slept a wink. Live and learn.